What's a Nintendo launch without a Mario game? The Gamecube launch, that's what! Most people came into this skeptical, wondering what Nintendo was thinking when they decided to have Luigi star in his own game for launch instead of the almost obvious choice, Mario. Well, Mario will have his time in the sun (hehe) next year and Luigi's time is now - and he's just as fun and timeless as his older brother. Luigi's Mansion takes place in a haunted mansion, where using his trusty Poltergust 3000, Luigi must capture all the ghosts who have escaped from their paintings and put them right back in. Use the Game Boy Horror to see their hearts and flash your flashlight on them to stun them and starting sucking them in! Each of the ghosts from the paintings has their own personality and their own individual weaknesses. Players must use clues and the Gameboy Horror to discover what those weaknesses are and how to use them to your advantage. Collect money and precious gems along the way to raise your overall rank at the end of the adventure. The length of the adventure has been the topic of some criticism. The game can be beaten fairly quickly. My first time took about 5 hours total. A lot of people have complained about this, and while it is a tad disappointing, the overall fun factor of the game overshadows its abrupt end. While I was playing the game, I was reminded of what great Nintendo gaming is all about, and it felt great. 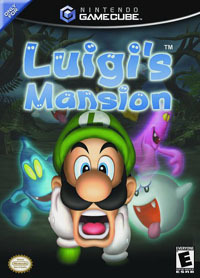 Luigi's Mansion is a fun game right down to the sounds of Luigi humming along with the music, all the way to the dazzling final battle. Visually, Luigi's Mansion is a winner. Clean and smooth graphics that really draw you into the little world Nintendo has created. The effects are amazing as well. When Luigi turns his vacuum on a tablecloth, it will look and feel as if it is being sucked in. I've got myself hooked on just sucking up ghosts, because it's just such a kick. I'm sure one day in the future I'll catch myself turning on the game just to catch a few ghosts. The play mechanics really take advantage of the Gamecube's superb controller. Tugging in the opposite direction with the analog stick makes the ghosts get sucked in faster and hitting the L and R buttons at certain pressures, adjusts the intake and exhaust of your vacuum. The game isn't all about sucking in things though. Luigi will gain access to certain replenishable elements (fire, water and ice) that he must use in certain situations to combat the ghoulish bunch. As far as replay value goes, once you've achieved the "A" Rank, having collected $100,000,000 over the course of the game, there really isn't any at all. You will gain access to the game from the beginning with a much more powerful vacuum, after completing the game once. All the negative aspects aside, Luigi's Mansion is definitely a good pick up for fans of FUN games and those die-hard Nintendo fans in love with the Mario universe. If you don't pick it up, then give it a rent for sure; any Gamecube owner needs to play this game at least once.